Having picked up Mikayla from the airport, there was no real point in staying amongst the resort high-rises of Hamilton Island. We were all tired of being tossed about on the mooring in the continuing gale, so we headed north to see if we could find a quieter spot in Cid Harbour on Whitsunday Island. The availability of anchorages in the Whitsundays is to some extent ruled by the presence of bare-boat flotillas. Cid Harbour is famous for its calm anchorage, but is also very close to the charter base at Hamilton Island. We had assumed that, since it was Friday and most charters begin and end on a Saturday, Cid Harbour would be packed with holidaymakers enjoying a final night. There were about twenty boats there when we arrived, but there was still room for us to squeeze into Sawmill Bay where we had beautiful flat calm and an undisturbed night’s sleep. Thanks to John and Nancy for suggesting it. Following on from our discovery of Alan Lucas’ misnaming and misrepresenting a bay a few days ago, we began to suspect that he hadn’t actually been to Cid Harbour either. Although it is indeed a fine anchorage, Lucas talks about showers and barbecues, and there is certainly nothing of the sort there, and no sign that there ever has been. However, turtles and dolphins siam all around the bay, and there are four coral beaches to explore. We also found a short bush trail leading from the main beach to nearby Dugong Inlet, and half way along this we noticed a minor tributary trail heading straight up the hillside. A passerby told us that this led, after one and a half hours, to the top of Whitsunday Peak (434m) from whence, he said, there were marvellous views of the the island. Naturally I was champing at the bit to climb it. The girls were more inclined to sit on the beach, so they went for a swim at Dugong while I set off. It was quite a climb, and obviously didn’t see much traffic, but the trail was reasonably obvious and the vaguer parts had been unobtrusively marked with surveyor’s tape. After an hour of hard climbing, I came across a scattering of dome tents hidden amongst the trees. A little later the trail improved markedly to a neat path, and I began to hear the sounds of voices and tools. Half a dozen park rangers were working on the trail, painstakingly chopping out roots, marking the edges with a border of stones, and where necessary fitting steps by half-burying large boulders and packing them with dirt. They were glad to stop for a chat, and told me that they had been there for about forty days, and were expecting to finish in another month or so. When they were finished with this particular trail, they would set up camp on another part of the island and start work there. They had been living and working in the Whitsundays for at least a year. It struck me that this would be my perfect job. The views from Whitsunday Peak were spectacular. 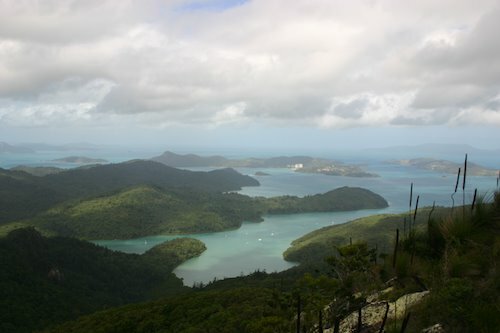 I could see our anchorage in Cid Harbour on one side, and across to Hamilton Island on the other. A vast expanse of islands and coral seas stretched to and merged with the horizon. It really is a lovely piece of paradise. Back down at the beach, Bronwyn and Mikayla had had an enjoyable if slightly cool swim, and had attracted the attention of a hungry crow and a pair of young goannas, not to mention some members of the tourist subspecies of homo sapiens. One particular group arrived after the arduous 1100 metre trek from Cid Harbour and rang their yacht to send a tender round to pick them up. They assumed that Mikayla and Bronwyn were tired and resting up before the laborious trek home! By the time that I had clambered back down to sea level, we had the beach to ourselves and were all glad of the chance of a good wash in the clear waters. Suitably refreshed, we headed back to the boat and fired up the barbecue for a nice veal roast before sleeping for a full eleven hours. This entry was posted in Australia, Oceania, Travel, Voyage of Pindimara and tagged Sail, Whitsundays on 2009/07/11 by Reinhard. Alan Lucas has in fact been to Cid Harbour, and there used to be showers, toilets and barbeques there at Sawmill beach. At the time you wrote this blog, there was still the big water tank that supplied the showers. Qld Parks and Wildlife Service removed all the barbecues to prevent fires, and removed the rubbish bins to stop people leaving their garbage. They also removed the showers because people were complaining when they found the tank empty. You must remember, Lucas wrote about The Whitsundays in the 70’s. When I first started sailing here, about 1980, some of what he wrote had already changed. He has never really updated Cruising the Coral Coast. Just releases it again occasionally, with bits of info people have suggested to him. So much of it is wrong now it is amusing as entertainment, but I would never, ever base a trip on it.